Das Foto zeigt das Kino Metropolis in Bochum am Hauptbahnhof. Das jetzige Programmkino ist eines der letzten Bahnhofskinos in Deutschland und es war auch das erste Kino in meinem Leben überhaupt, sozusagen der Geburtsort meiner Liebe zum Kino. 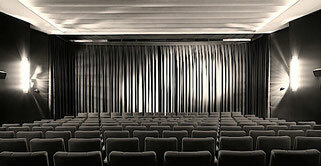 This picture shows the filmtheatre Metropolis at the main station of Bochum. Now a repertoire theatre, it is one of the last railway station film theatres in Germany - and bey the way the first film theatre of my life. My love for Cinema is born there. See this text in english.